I don’t think I have ever met a native plant grower who did not believe that they could fit one more plant into that small space in the garden, even though they know it will grow 2m by 2m. We are ever optimists! 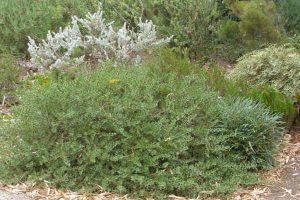 This generally results within a few years in a garden that is overgrown, with pathways buried and the characteristics of individual plants lost. If we also unwisely chose plants that turned into large trees, we may well also be faced with the considerable expense of removing them. ♦ We sometimes choose the wrong plants. In the 1970s when I began growing native plants, there was a pretty limited range available and knowledge was thin on the ground. We all grew Melaleuca armillaris, M. nesophila, M. hypericifolia, Hakea laurina, Eucalyptus lehmannii and hosts of nondescript grevillea and callistemon hybrids. Those same plants after 20 years are huge and many have fallen over or smothered the other plants we confidently placed just a couple of metres away. We should not make these same mistakes today. ♦ Plants become old and scruffy with age. Unfortunately for us, many of the taller shrubs finish up with foliage at the top and at the ends of branches, leaving bare, untidy trunks, and stems. Tip pruning from an early age can help reduce this problem but it is a daunting task to prune hundreds of plants in a large garden. Plants partially die, and when you cut the dead sections out, you are left with a lop-sided shrub. And, particularly if the plant is rare, we are reluctant to remove it as long as it flowers, no matter how leggy it has become. ♦ Some plants are naturally short-lived. Wattles are probably the best known examples of plants with a limited life-span but I have found that many W.A. banksias and dryandras live for only 12 to 15 years in eastern Australia unless they have excellent drainage and deep soil. This means that no matter how carefully you have chosen plants to suit your garden, some will die prematurely and you will be left with the next problem. ♦ When large shrubs die, they leave unsightly holes in the garden. Murphy’s law of gardening always applies! The plant which dies is the one that leaves the largest hole behind. 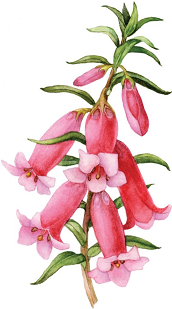 Sometimes, it is a bonus and you replace one plant with several, but, all too often, you are faced with trying to establish a small replacement plant in a shaded, dry area where it grows all too slowly. ♦ Old gardens have too much shade. I have always maintained that dry shade is the most difficult garden situation. Sure, you can grow correas, westringias, prostantheras and perhaps some boronias but if you want more variety, quick growth and lots of flowers, then dry shade is your enemy. An old garden is also likely to have some large trees (especially if you have been trying to attract birds) and removal of these to allow the sun back can be very expensive. ♦ Old gardens are often too dry. When I built my house, our block was so wet that the builder was delayed for several months before he could pour the slab. Now, even in the wettest winter, water does not lie anywhere and the garden is never waterlogged. My many hundreds of shrubs and trees see to that. The downside is that areas near trees are still bone dry 10cm down even in winter. Establishing small shrubs under these conditions is extremely difficult. ♦ There is root competition from established trees and shrubs. Shade, dryness and root competition often go hand in hand. While it is usually easy to establish a small shrub with a large tree if you plant both out at the same time, trying to grow that same shrub when the tree is full grown is near impossible. When you dig in an old garden, the soil is often packed with tree and shrub roots. They remove the moisture and nutrients which a new plant requires to establish itself, making it hard for the new plant to gain a foothold. The slowness of growth of plants under these conditions leads to the next question. ♦ Does the soil become impoverished in an old garden? This question raised a lot of discussion but no clear answers. Several members mentioned that soil often becomes compacted in an old garden and suggested digging the area over before planting. The slowness of growth suggested to others that many of the nutrients in the soil had been removed over time, especially if fertilisers had not been used. Others contended that natural break-down and recycling of mulch and leaf litter would replenish the nutrients removed by growing plants and pointed out that the legumes (wattles etc) actually added nutrients to the soil. Everyone agreed that breaking up compacted soil and adding material such as rotted manures should certainly help in establishing new plants. ♦ Our expectation that the garden will remain the same. We forget that a garden is dynamic and that we cannot expect it to remain unchanged. A garden is ever changing and we need to accept this. It needs maintenance and upgrading, and regular attention may well reduce the amount of effort required when a major rejuvenation is needed. ♦ Try not to make the same mistakes again. This is an obvious start but easier said than done. We go to a plant sale and come home laden with new plants when we really don’t have the room. At least on the second time around, we should know more about suitable species and avoid those large shrubs and trees. Experience should also have taught us about the ones which become scruffy with age and those which are short-lived. In other words, we should be better equipped to make a more informed selection. But it will largely come to nothing if we don’t have a plan. ♦ Have a plan, even if it is only a rough sketch. To avoid that problem of overplanting, it is essential to draw up a plan of the area to scale and then lay out on it the approximate spread of the plants we are proposing to use. There is plenty of information around on this and we really do need to stick to what our plan shows in terms of spacing and number of plants for the area. Avoid the temptation of trying to squeeze that extra one or two in. Other requirements such as planting themes and plant associations and height of the plants must also be considered at this time. Tip pruning at planting out should also be done to try to encourage bushy and better shaped specimens. ♦ Don’t try to do too much at a time – attempt small, manageable sections. This is old advice but it should be listened to. It is much better to do small areas well rather than try to knock everything over in one season. I am currently looking at three small areas in three different beds which I have decided to replant this spring. As the original plants are too leggy and woody to try to save, I have taken cuttings of several that I want to grow again but not necessarily in these areas. The main problem I have is the unwillingness to cut down specimens that I grew from seed or cuttings 15 to 20 years ago, yet this is what needs to be done. ♦ You may need to be ruthless – cut everything out from an area and start again. Original garden bed before tree was planted. 20 years later. The Corymbia citriodora has grown and the area has a natural bush appearance. I have come to the conclusion, albeit reluctantly, that it is fairly pointless to save a few old plants if they can’t be pruned or shaped to fit in with the new garden. Take cuttings or buy a new plant of some particularly prized species and then cut everything out. Particularly if the bed has not been dug over or been given any attention for years, it is probably worthwhile to dig in some rotted fowl or sheep manure and leave it lie fallow for some time. A cleared, dug-over area enables you to plant exactly where you want to and not have to try to fit in around existing shrubs. ♦ The mulch and leaf litter in an old garden – is it a good or bad thing? This was a contentious point with both schools of thought having their say. Some felt that the litter, especially eucalyptus leaves, somehow soured the soil or rendered it water repellent or took nutrients from it. Others pointed out that recycling of leaves and plant materials occurs naturally in the bush so why should it be any different in the garden. With my areas, I intend to clear all the old litter away, dig them over and add manures, and after planting, add my own mulch. ♦ Selection of plants and pruning. As I indicated at the start of this section, second time around we should have a much better idea of what plants do and what to select. We should also be prepared to tip prune to encourage bushiness and perhaps carry out more maintenance to forestall problems such as leggy and overgrown plants and overcrowding. If you have done it correctly, you should have a different but better garden this time, one that will still give you a lot of pleasure but this time should be longer lasting. Well, I don’t have a solution to that but I would really like to hear from others who may have solved what I regard as my biggest problem.